A few years ago we sat in an IEP meeting where we were asked which letters of the alphabet we wanted Caden to know. The specialist running the meeting just couldn’t grasp that we might think he could learn A-L-L the letters of the alphabet. If left to her own devices, I still wonder which letters she would have picked as the important ones. What we all did agree on though was that he needed to focus on printing because the straight lines made more sense to his logical brain than the spirals of cursive. Fast forward a few years and onto another school. 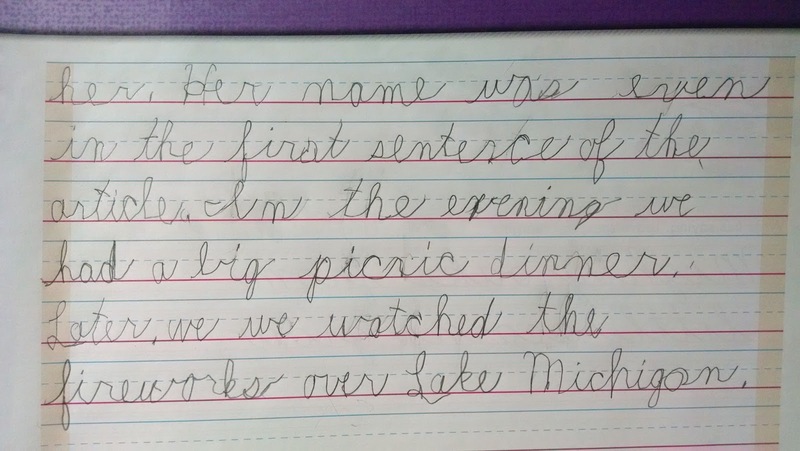 We knew cursive writing would be introduced in 2nd grade in this particular program. We have been dreading it and worrying about it since we learned this information last year. We have debated several times writing cursive into his IEP but kept thinking we still had time to make that decision. 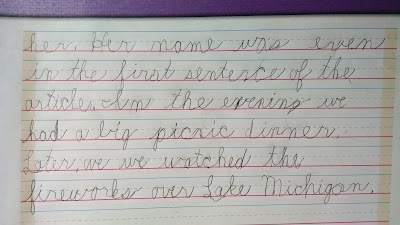 Then the day came where we opened the lessons for the day and an introduction to cursive writing was on the day’s lesson agenda. We cautiously mentioned this to Caden and he was adamant that he wanted to try. In fact he was convinced that he could handle cursive writing this year. We weren’t as equally convinced because our memories were a bit more vivid in how frustrating cursive had been for him a few years ago and just exactly how long it had taken him to learn the printed letters. We didn’t really want to argue with Caden though so behind the scenes we talked to his teacher. 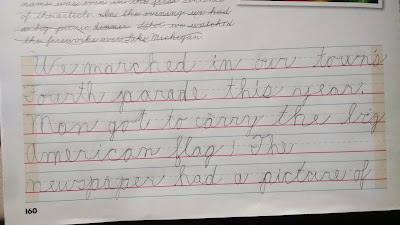 The teacher assured us they didn’t really expect much out of the students in relationship to cursive in 2nd grade so if he wanted to try it, there really wouldn’t be any negative grade impact. With a lot of parental nerves and anxiety, we jumped into cursive. It began as something new and exciting for Caden and then over the course of the semester became the bane of his existence with him asking every-single-day if it was a writing day. 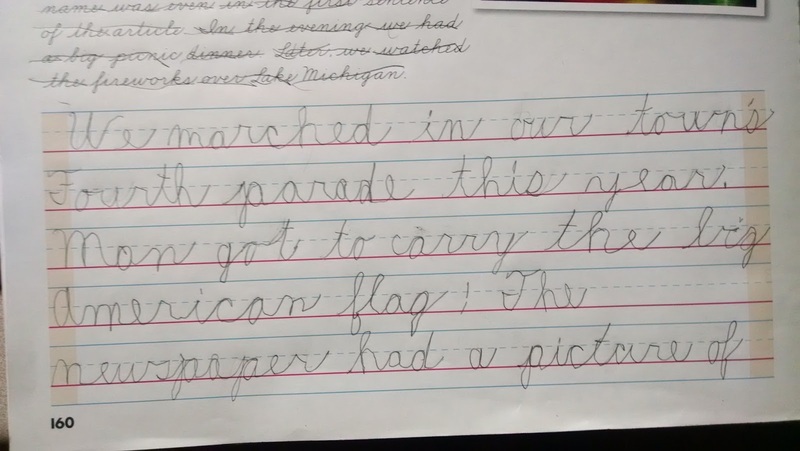 His final portfolio of the year required writing an entire paragraph in cursive. I have to say the tears and fear over this assignment were real from all of us. We were ready to call in the IEP team if this went south and mentally walked ourselves through the mental recovery process we would employ if Caden’s confidence was shattered. Of course it isn't perfect; I don't even know what grade he is going to earn on it. Honestly I don't care. The lesson learned is priceless--and it isn't one that Caden had to learn. The real lesson was that as parents we always need to presume competence. We would be the first to defend Caden if anyone else questioned his ability but that's exactly what we did in our attempt to "protect" him. We tried to use a "regular" measurement for his ability when he is extraordinarily his own unique self. This is clearly an indication that it is time to start including him in these conversations and let him participate and add input when he feels comfortable doing so. 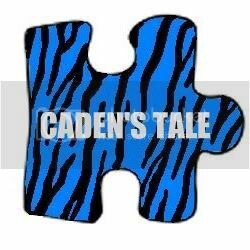 Although we'll never be too far behind, it is time for us to start letting Caden take the lead in this journey. Instead of thinking in terms of what he can't do, we need to presume competence and then figure out how to outfit him with the tools to set his own goals, timelines, and ways to reach his idea of success. This is after all his tale to write. Six years ago, Caden was in the emergency room after having several seizures. We had blizzard-like conditions, and were waiting to see what sort of transport could move him from our community hospital to a much larger children’s facility. While waiting, a lady entered the room to draw some bloodwork. After looking at his chart, she casually asked “so how did he get autism?” It was just a question, but at the time it caught me off guard, mostly because I was a little worried about letting someone who knew so little stick a needle in my baby boy. In the years after, though, I realized that the spectrum of questions special needs parents hear is as large as the autism spectrum itself. Some questions are truly information-seeking from someone either with little experience or a new diagnosis, and some are horrifically offensive. I’ve heard that “he’s just a boy,” “he just needs punished,” that he will “grow out of it,” and that I should “just institutionalize him” so that he doesn’t ruin my other children’s lives. I think I was almost prepared for the comments and questions when we brought Elf the super service dog home. We’ve been asked if “he is blind,” “how we drive so well” since we are obviously blind, “what’s wrong with him,” and that it is “horrible to waste” such a highly trained dog on a child who will never amount to anything. My intent is to educate when I think education is possible, and let the comments roll off when education doesn’t seem likely. After all, most of the time my children are watching and listening, and I don’t want to set the example that they ever have to explain themselves in that manner. On the wrong day, though, a snarky comment will leave my mouth or a particular finger will wag at them from the confines of one of my pockets. All in all, though, every time a comment or question occurs, I think that’s the last time I will get caught off guard. And every single time, I’m wrong. I’m quickly learning that being an adoptive parent also comes with a fair share of questions and comments. Some are genuinely curious, such as “how did you manage to adopt a boy from China,” while others are just plain inconsiderate, such as the emergency room doctor who asked how much the littlest little “cost.” Sometimes I can tell the question comes from a place of genuine interest, and I take the time to carefully find my words to answer not only the question but also model word choices. I have, however, been known to reply with “let me look to see if the price tag is still on him” in a moment of exhaustion. That was obviously not my best reply, but some days you struggle just to accomplish what needs to get done without having the extra time that the conversation really calls for or you just realize that nothing you say is going to leave an impact. That’s honestly a trickier line to teach the kids, so that they are prepared when the comments or questions are directed at them. The other day, though, while the oldest and middle littles were in the hospital receiving their IVIG infusions, I was walking the littlest little around the hallways because he was clearly having a moment. Maybe it was a 2-year-old moment, maybe it was a post-major surgery moment, or maybe it was an adoptive moment…it is kind of impossible to tell at this point in life. I deliberately walked to an end of a floor that I knew didn’t house in-patients so that his crying wasn’t disturbing anyone who needed the rest and solitude. A woman, however, was walking in the same hallway, and she made the very, very casual comment that he probably wouldn’t be crying if he had his real mom. And with that one word, the tears began. Maybe it was because I am a very tired mommy or maybe it was because we have had a lot of major medical stuff lately. Maybe it was because I am constantly worried about attachment and bonding issues and if I am doing things right as an adoptive mommy, or just maybe she articulated one of my greatest fears. I love my littlest little with all my heart and I always will. There’s no challenge that will ever change that fact, but there will always be a part of me that knows I am the 2nd best choice to be his mother. In the perfect world, his biological mother would have been able to care for him, he could have stayed in his homeland, and he wouldn’t have experienced so much trauma in his life at such a young age. I’m absolutely not his biological mother, but I’m not so sure about this word “real.” It sure seems real when I am up with him in the middle of the night, when I am kissing him goodbye as he heads off for surgery, as I am watching him learn a new word or skill, and as I watch him play with the oldest and middle littles. It sure seems real when we have one of those moments where he just stares into my eyes and I don’t want to blink in fear of losing that moment because that moment gives me hope about attachment and bonding when I’m reading yet another article or book that gives me contradictory advice over what I am doing. The tears I’ve cried with and for him are equally real, and I know in a heartbeat that I would take away his pain and suffering if I could. But is that “real?” I guess ultimately that will be up to Sayre to decide, and I can only hope in my heart of hearts that I am “real” enough for him. If sticks and stones can break my bones, what about words? How do you begin to describe how deeply those questions and comments hurt a momma’s heart, especially when they include the word real. Some days, the stories are funny, some days they are heartbreaking, but they are always a part of the real journey that we call life.